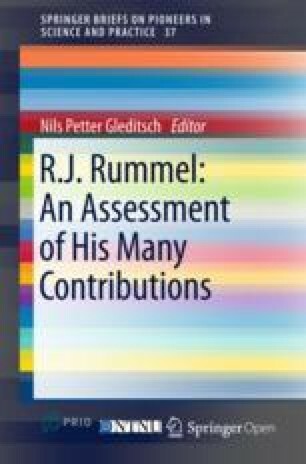 Rudy Rummel consistently was a bold and innovative scholar. In the 1960s, the field of international relations was still in the grip of contemporary and diplomatic historians or international lawyers. This did not satisfy him. He looked for a more scientific approach modeled on the natural sciences. Erich Weede, b. 1942 in Hildesheim (Germany), taught sociology at the Universities of Cologne and Bonn (1978–2004) after acquiring academic degrees in psychology and political science. In 1982–83 he was president of the Peace Science Society (International), and in 1985–86 vice-president of the International Studies Association. His books include Economic Development, Social Order and World Politics (Lynne Rienner, 1996) and The Balance of Power, Globalization, and the Capitalist Peace (Friedrich-Naumann-Stiftung, 2004); Email: e.weede@uni-bonn.de. Rudy Rummel consistently was a bold and innovative scholar. In the 1960s, the field of international relations was still in the grip of contemporary and diplomatic historians or international lawyers. This did not satisfy him. He looked for a more scientific approach modeled on the natural sciences. He wrote one of the first dissertations that may be labeled as quantitative international politics or scientific peace research. His ‘Dimensionality of Nations Project’ (Rummel, 1972) was one of the early big data collection efforts in international politics. As far as I can see, he was one of the first (or even the first) to make the dyad instead of the nation state into his most important unit of analysis (Rummel, 1977). Today it is hard to imagine quantitative research in international politics without analyzing dyads. Psychometrics rather than econometrics provided the research paradigm in the early days of the quantitative approach to world politics. That is why much of Rummel’s work relied on factor analysis which is a basic tool of psychometrics. By contrast, current quantitative research on international relations is more influenced by econometrics where regression is the most basic tool. His methodological innovations first attracted me to Rummel and his work. He also permitted me to use his data base for my quantitative dissertation project. Having had some education in psychometrics before I turned to political science and international relations, his approach to the field looked plausible and convincing, even paradigmatic to me. Important as his methodological innovations have been, he also contributed to substantive theory. The intellectual roots of the democratic peace theory date back at least to the 18th century, and another American scholar revived interest in the idea shortly before Rudy, but it was his work that instigated an explosion of interest and research on the topic. Although nothing is beyond dispute in the social sciences, Rummel’s view on the existence of a democratic peace has become the dominant view among contemporary researchers. Later, Rummel expanded his research agenda. He no longer investigated only wars or deadly quarrels, but mass murder or ‘death by government’ (Rummel, 1994). In his view: ‘Freedom inhibits violence’ (Rummel, 1979: 292). Whereas many or most adherents of the democratic peace theory may be labeled ‘doves’ or even ‘leftists’, these labels never fitted Rudy. He was a staunch anti-Communist during the Cold War (Rummel, 1976) and a hawk even beyond it. He was a libertarian and a believer in limited government. Although his work did never really focus on ‘the capitalist peace’, one may regard this more recent line of thinking and research as a continuation of his work. Certainly, it fits his libertarian spirit. This sketch of Rummel’s research agenda and conclusions raises the question: How can one simultaneously be a libertarian and a hawk? Libertarians want to minimize government. Hawkish foreign policies cannot avoid expanding government, at least military establishments. To put the same issue into a slightly different perspective: Most hawks are adherents of the realist approach to world politics. Like Rummel, realists believe in military power, not in soft power. Are Rummel’s views consistent? They might be, if one assumes that enemies exist, that they are not merely products of misguided imagination. Here, Rummel (1979: 292) himself provides some cues in his writing: ‘Libertarian systems are the natural enemies of authoritarian and totalitarian states. By their example and the products of freedom they are naturally subversive of authoritarian and totalitarian systems; and these freedoms seem to make libertarian states defenseless against unilateral changes in the status quo.’ Like realists, he worried about challenges to national security, deterrence, and defense. Since I largely share his views and also combine libertarianism with a certain degree of hawkishness, I shall dare to attempt to reconcile what many or even most political scientists regard as irreconcilable. Russian aggression or the persistent crisis in the Ukraine provides the background for my attempt. Being a hawk, Rummel was close to realism. Nevertheless, he was not a member of that school of thought. Otherwise, he would have been more interested in the distinction between vital and peripheral interests, in power transitions and the decline of nations, and in spheres of influence. Using the label ‘realist’ does not necessarily say that ‘realist’ theorizing is true, or at least better than other theories. But there is probably no view of world politics that is more widely accepted than realism among national security elites of the great powers. The starting point of realism is the belief in the existence of a ‘security dilemma’ or an ‘anarchical order of power’. Since there is no effective authority which can impose order and peace on great powers, states have to take security into their own hands. They have to prepare for the worst, i.e., aggression by other powers. The obvious strategy is to seek ‘security by superiority’ or ‘peace by strength’. Unfortunately, it is inconceivable that all great powers are superior to all others and therefore safe. Superiority is a positional good. Claiming it for oneself implies denial to others. Therefore, realists regard world politics as a ‘tragedy’. In contrast to many adherents and promoters of the democratic peace, they consider moralizing dangerous, more likely to enhance risks of war than to diminish them. Realism is descriptive as well as prescriptive. According to Mearsheimer (2001: 12), ‘Although there is much truth in the description of great powers as prisoners trapped in an iron cage, the fact remains that they sometimes—although not often—act in contradiction to the theory. … As we shall see, such foolish behavior invariably has negative consequences.’ From a realist point of view it is important not to let moral judgments cloud the distinction between vital interests which might merit a fight and lesser interests which could detract one’s attention from more important issues. The Russian take-over of the Crimea, Russian support of separatism in the Eastern Ukraine, and Russian destabilization of the Ukraine alarmed Western politicians. Before 2014 Russia was believed to be—or, at least, hoped to be—a status quo power and resigned to its loss of influence in its near-abroad. Politicians in the West rarely thought about red lines which might exist in Putin’s or other influential Russian minds. NATO and the EU expanded, in the Baltic even including three states which had been forced to be part of the Soviet Union itself. In contrast to the small Baltic republics, however, the Ukraine was not a victor’s booty after World War II. The historical link between the Ukraine and Russia is deep. Talk about Ukrainian NATO membership, and later about a special relationship with the EU must have raised alarm bells in Moscow. But many European politicians are so innocent of familiarity with realist thinking that they could not imagine that Russia did simply not believe in the pacific self-image of the EU. Realists in Moscow observed relentless NATO and EU expansion into former Soviet territory and assumed the worst about Western intentions. In order to forestall an imagined Western expansion, Russia itself expanded. Although ‘realism’ is the dominant school of thought in international relations, it is not the only one. According to realism, the security dilemma condemns mankind to live with the risk of war forever. Since realists focus on conflicts of interest, they might nevertheless (or: therefore?) empathize better with opponents than others.2 In debating NATO expansion eastwards, some realists are less expansionist than others (Mearsheimer, 2014b). In the nuclear age, admitting that great power politics remains a tragedy is not attractive. A rival school of thought is sometimes called ‘idealism’ or ‘liberalism’. It is more optimistic. In contrast to realism, it even provides some hope for avoiding a clash of Chinese and Western civilizations. According to this line of thinking, either economic interdependence or democratization or both may significantly reduce the risk of war. From this perspective, globalization is useful by spreading interdependence and prosperity first and, possibly, democratization later. For some time quantitative research (Gartzke, 2005, 2007; Russett & Oneal, 2001; summarized by Weede, 2011) has demonstrated that the risk of war between nations is reduced, if they trade a lot with each other. There is something like a commercial peace or peace by trade.3 Until recently the debate among researchers was whether the commercial or capitalist peace is as strong as the democratic peace. Now, the ground is shifting toward the question which aspects of a capitalist order promote the avoidance of war most effectively: Is it trade or the expectation of future free trade (Copeland, 2015)? Or, is it the avoidance of protectionism? Or, is it the avoidance of state ownership of the means of production, of state-owned enterprises (McDonald, 2007)? Or, is it financial market openness and economic freedom (Gartzke, 2005, 2007)? All of these specific interpretations of the general idea of a capitalist or commercial peace seem to justify some optimism about the effects of globalization or the export of capitalism from the West to the rest of the world. In particular, it should be underlined that economic cooperation pacifies the relationship between a rising China and the West. One could even conceptualize the democratic peace as a component of the capitalist peace (Weede, 2011), because democracies prosper best in wealthy countries, because capitalism or economic freedom and thereby globalization contribute to prosperity. Since rising powers tend to challenge the political status quo (Organski, 1958; Organski & Kugler, 1980), it is good luck that the still dominant US and rising China seem to prosper under global capitalism, that they trade a lot with each other and are economically interdependent. Since neither realist nor liberal—or, in Rummel’s terms, libertarian—hopes for peace based on economic interdependence, prosperity, and democracy present a full picture of world politics, one has to face the question whether realist and liberal convictions can be reconciled. A prerequisite for reconciling these seemingly irreconcilable views might be the recognition of spheres of influence (Etzioni, 2015).4 During the Cold War the Western alliance system was something like an American sphere of influence, and according to Brzezinski (1997: 53) this remained true beyond it, whereas the Warsaw Pact was the Soviet sphere of influence. Deterrence could work because both sides understood where the red lines were. Recognition of spheres of influence comes easily to realists, but is more difficult for liberals or peace researchers who are interested in human rights and democracy. But the capitalist peace, including the democratic peace, may be attainable only, if the West recognizes that non-democratic great powers, including Russia, insist on maintaining spheres of influence. Except for North Korea and the South China Sea the outlines of China’s sphere of influence are not yet clarified. In Moscow or Beijing, a Western denial of Russian or Chinese spheres of influence looks indistinguishable from a Western claim to global hegemony. As Huntington (1996) has underlined, the United States and Europe (including Poland and the Baltic states) belong to the same civilization. From this perspective, the Atlantic Alliance looks natural, certainly more natural than Putin’s vision of a Greater Europe running from Lisbon to Vladivostok where Russia could hope to play a leading role.7 From an American perspective and, possibly, from a British perspective, too, a united Greater Europe from Lisbon to Vladivostok would transform the fruits of victory in two world wars and the succeeding cold war into a nightmare. Gray (1986: 17) has characterized the foreign policy goals of the Anglophone sea-powers in these terms: ‘The same rationale that for four hundred years moved British statesmen to join or organize coalitions to deny continental hegemony, has been the publicly under-acknowledged geopolitical Leitmotiv for American international security policy since 1917 (though with an extensive lapse in the interwar period). A continental super-state would be able, if unopposed by land, to translate superior land power into what might become superior sea power … From a geopolitical perspective, the Soviet challenge to American security is the same as was the German.’ If one puts aside the demographic weakness of most of Europe as well as of Russia, then Putin’s plans for Greater Europe—though unlikely ever to be realized—would be a worse challenge to Atlantic sea-power than previous historical challenges. One should also consider, however, that the inclusion of Russia in a Chinese sphere of influence might be even worse from an American perspective than Putin’s dreams about Eurasia. Given the decline of Europe and Japan, and the economic head-start of China over India, future struggles for hegemony will put China against the United States. A core issue of the future hegemonic rivalry concerns whether the Russian natural resource treasure chest will become more easily accessible to Europe and the West or to China. By not conceding a sphere of influence to Russia now, in Ukraine and elsewhere in Russia’s near-abroad, the West might push Russia into a nascent Chinese sphere. Simultaneously, Western economic sanctions against Russia might teach ascending China the lesson that economic interdependence with the West might be incompatible with its national interest. Rudy’s research program and his strategic views evolved during the cold war. Bipolarity and the mutual balance of terror looked like persistent characteristics of the strategic environment. Under these conditions, the tension between libertarianism or the promotion of the democratic peace and deterrence or balancing the Soviet Union was limited. Libertarianism and the democratic peace were applicable within the West. Realism and the need for ‘security by superiority’ were essential towards the Soviet Union. Currently, the strategic situation is different. Bipolarity has gone, the Soviet Union has disappeared. But China is rising. Of course, no one can know, whether Rudy would have made an argument like this or developed an entirely different one. But we do know that he would have had a definite view on the Ukrainian crisis and been outspoken about it. Ultimately, his legacy is his example. He was not afraid of a new research paradigm, nor of offending the strategic consensus of the multitude who never even thought of doing research. According to some geopolitical theories (Bernholz, 1985; Collins, 1986: 167–185), accessibility to other great powers or an interior location in the configuration of great powers is a disadvantage, whereas a peripheral or marshland location is an advantage. Russia currently has the least favorable geopolitical location of all great powers or candidates for great power status. It faces China and Japan in the East, and Europe in the West. By contrast, the US has the most favorable location. It is surrounded by oceans rather than being close to other great powers. Collins (1986: 167ff) predicted the future decline of the Russian empire. Since he underlines the continuity between Muscovy, Tsarist Russia, and the Soviet Union, it is plausible to extend his geopolitical arguments to Putin’s Russia. See, for example, Gelb (2015: 10): ‘It is totally unrealistic, however, to think that the West can gain desired Russian restraint and cooperation without dealing with Moscow as a great power that possesses real and legitimate interests, especially in its border areas.’ Obviously, the Ukraine is the most important border area for Russia. Copeland (2015: Chap. 2) reads the quantitative literature somewhat differently from me. But he agrees with me on the fact that most researchers see economic interdependence as a pacifying condition and that the democratic peace is anchored in economic cooperation. He focuses on interactions which permit interdependence to increase or decrease conflict contingent on conditioning variables. Copeland (2015) provides an alternative approach. In his argument, the pacifying impact derives from expectations about the future rather than from the present state of affairs. I cannot imagine that Western sanctions today make Russians, or even the Chinese, more likely to expect lasting benefits from interdependence with the West. According to the empirical literature (Hufbauer, Schott, Elliott & Oegg, 1997; Morgan, Bapat & Krustev, 2009; Pape, 1997; Whang & Kim, 2015) contentions about their effectiveness vary, but include some devastating comments, such as: ‘In most cases a state imposing sanctions on its opponent can expect an outcome that is just about the same as would be obtained without sanctions.’ (Morgan & Schwebach, 1997: 46) Moreover, even Hufbauer et al. who do assert that economic sanctions sometimes work, admit that they tend to be least effective against strong, stable, autocratic, and hostile targets. As Simes (2014: 11) pointed out, even resolute sanctions against Cuba, North Korea, Iraq, or Iran did not produce the desired result. One should expect Russia to be somewhat less vulnerable to sanctions than these much smaller countries. The American oil embargo against Japan before World War II may even have contributed to the subsequent war. Lukin (2015: 65) recently called for ‘a pan-European center of power based on three legs: Paris, Berlin and Moscow’.